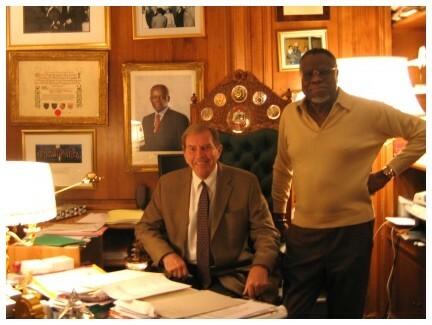 John Howard Sanden and Ambassador Fernandez in the latter's study in Paris in 2005.
is Excellency Ambassador Antonio Fernandez is one of the most extraordinary Africans of modern times. Originally from Lagos, Nigeria, he has achieved outstanding success in the business world. But it is as a diplomat and international mediator that he is best known. He maintains beautiful estates in Brussels and Edinburgh, in addition to his palace in Kano, Nigeria. Traveling in one of his jet planes between these homes and other world capitals, the Ambassador confers with heads of state as he moves around the world. For years he represented the Central African Republic in the United Nations. In 1977, Ambassador Fernandez commissioned me to paint a series of state portraits of hereditary African kings. I began with the legendary Alafin of Oyo and the elderly Oni of Ife. Years later, in 2005, I returned to Africa to create a series of paintings celebrating the Fulani peoples of northern Nigeria and central Africa. In the interim, Ambassador Fernandez had received a number awards and titles, including Baron of Dudley (conferred in Scotland) and Garsan Fulani of Kano, an illustrious traditional honor bestowed on him by His Royal Highness the Emir of Kano, Nigeria. On September 10, 2004, the Emir bestowed the title on Chief Fernandez at the royal palace of Kano. Following the ceremony, a colorful procession made its way from the palace out into the streets of the city. Horsemen in multicolored costumes escorted the Ambassador, their mounts arrayed with fabulous colors and decorations. That procession is the subject of the paintings on the following pages. 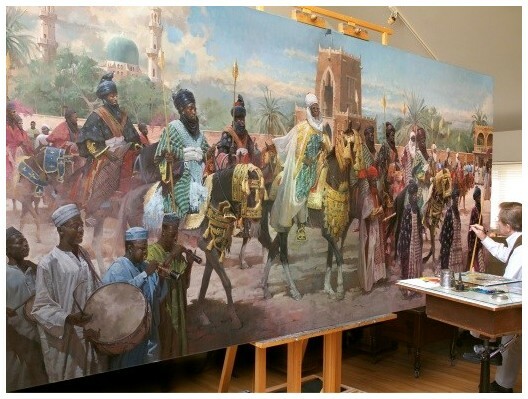 At work on "Procession from the Turbanning Ceremony of His Imperial Highness the Garsan Fulani of Kano."